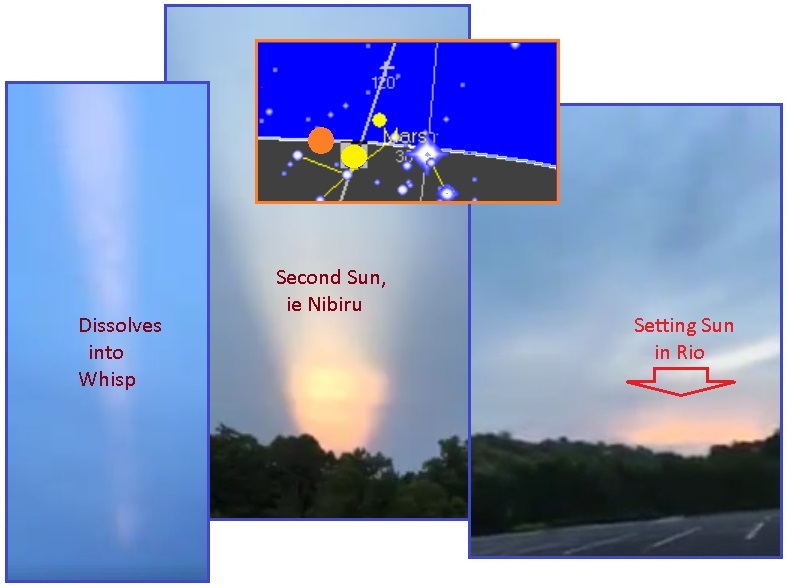 How could NASA confuse the public during these days of increased visibility of Nibiru, with many people seeing a Second Sun rise or set and noticing not only Nibiru itself offset from the Sun but the brilliant Moon Swirls that are carried in the vast tail? Chemtrails have been used to create a smeary sky for years, and the increasing debris in the tail that slings Earthbound is being billed as asteroids or space junk. But could those behind the cover-up over Nibiru create confusion over the sight of Nibiru and its Moons? They could try, by blowing colorful clouds high in the atmosphere, supposedly to learn more about the ionosphere. Per the Zetas, NASA and the cover-up over Nibiru has always counted on the Sun, so they could blame the Sun for electro-magnetic pulse (EMP) and perhaps even increased volcanism and earthquakes. Certainly for many years they tried to coordinate solar activity with the EMP disruptions on Earth, but their timing was off. They would announce the solar activity after the EMP struck. Then the Sun went sleepy, an extreme lack of sunspots, just when the cover-up was hoping to move the Sun to center stage. But could NASA enhance or replace the sunlight arriving on Earth, to create the effect they are so desperate to have? Could they use some kind of a sunlight generating machine up in space, carried by satellites or some such means? Is this what their 1966 patent for just such a sunlight simulating device was about? ZetaTalk Opinion 7/31/2017: The elite have of course tried to fog the skies with chemtrails, so looking through the smeary sky to discern Nibiru becomes difficult. 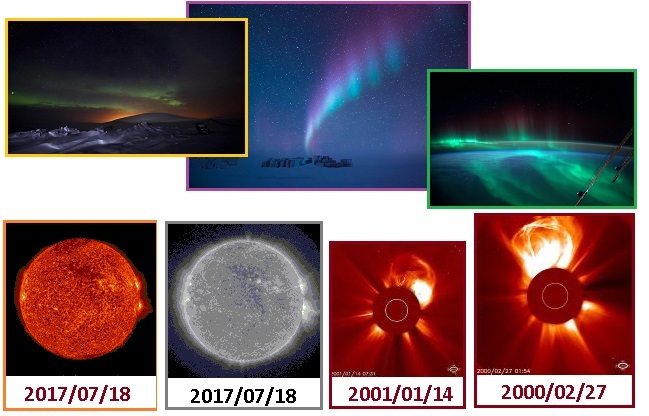 NASA had likewise hoped for lots of solar activity to blame for increased electro-magnetic pulse (EMP), but the Sun cycle has instead produced an extraordinarily sleepy Sun. 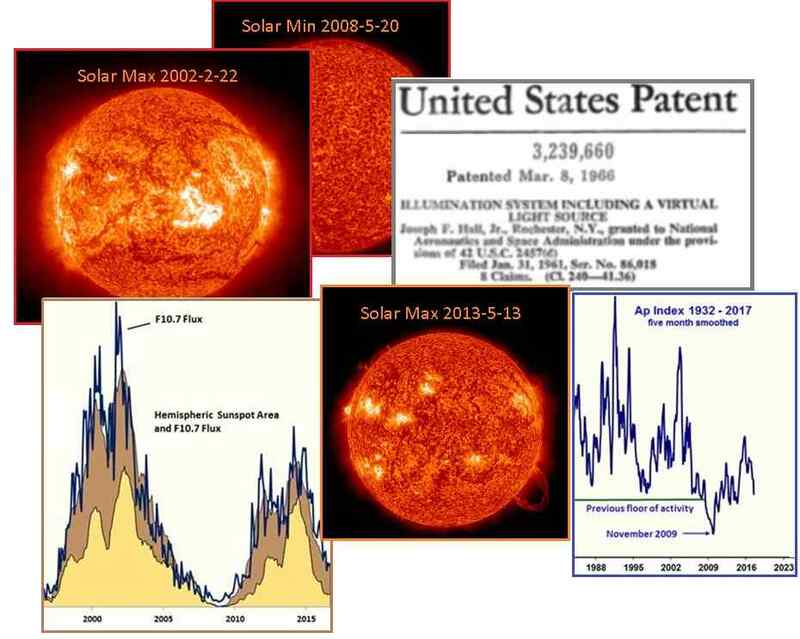 They can of course swap current images of the Sun with older images from their archives, and lie, as they control SOHO and SECCHI and NOAA reports on solar emissions. But how to control what the public sees in the skies? And right on schedule, the light show has started! Claiming it was from the Sun, during this Solar Minimum when the Sun is asleep. 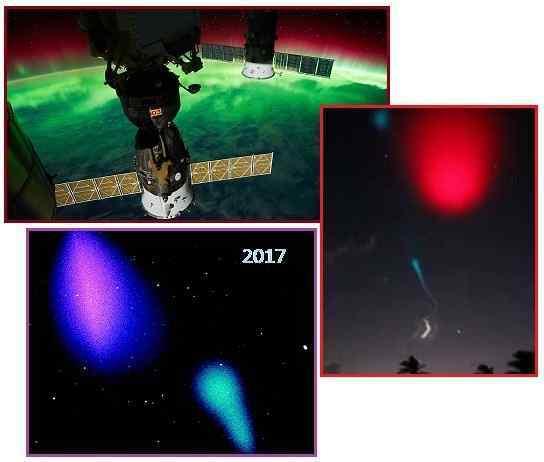 We are encouraged to look not at the Auroras but into the “higher latitudes” where NASA’s cloud painting has blown red and blue/green clouds! The geomagnetic storms that caused the auroras to reach further south than normal have begun to settle down and the lights have retreated to higher latitudes. Look up the latitude of your current location and if the number is greater than 40, it's worth stepping outside periodically this evening to see if you might get a glimpse of those magical, dancing northern lights. Thanks to a coronal mass ejection (CME) by our sun, geomagnetic storms are now underway. These storms don't result in any rain or lightning, but rather the high latitude light show that often looks like flowing waves of neon greens, blues, reds and purples in the sky. Auroras have already been sighted in New Zealand (where it's technically the aurora australis) as well as in Washington, Minnesota and Wyoming, according to spaceweather.com. 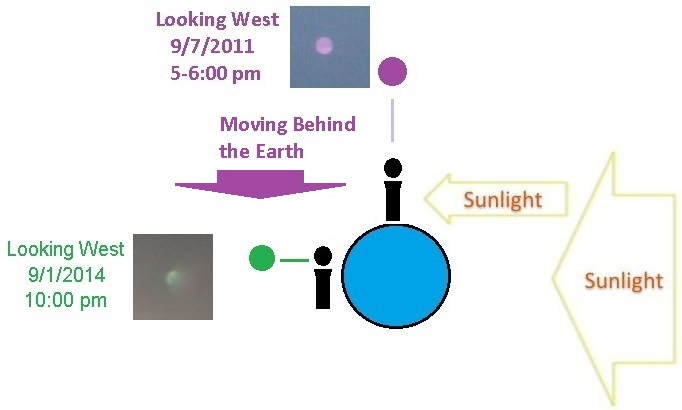 Nibiru visibility is indeed increasing, as documented on the Pole Shift ning blog dedicated to these captures. A video capture taken July 10, 2017 became very popular on the Internet and was termed a Farmer’s Capture of Second Light Source. Per the farmer’s comments, he is looking West and the Sun is setting but well above the horizon, so this Second Sun would be termed the 4 o’clock position to the Sun. The capture appears to be in the Southern states of the US, based on the farmer’s accent. 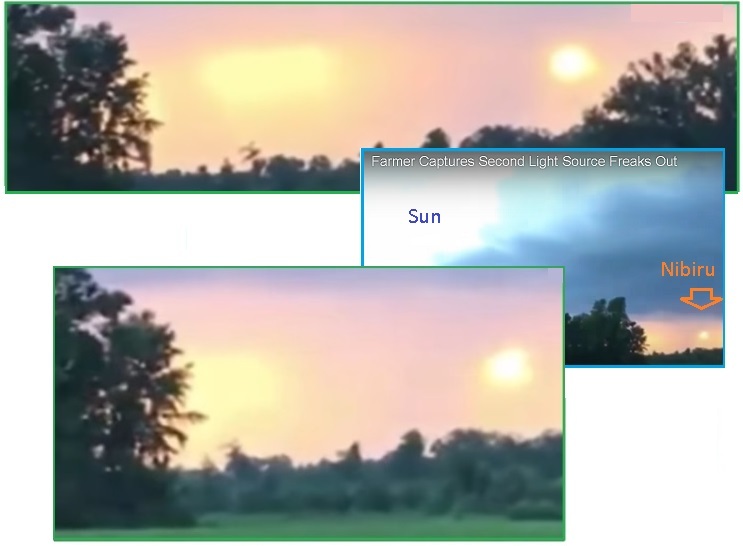 Another Second Sun capture occurred on July 12, 2017 at sunset at a Southern Hemisphere location, likely Brazil based on the comments on the video in Portuguese. The angle of the Ecliptic at that time puts the Sun on the right and the dramatic Second Sun on the left, at the expected 11 o’clock position to the Sun for the Southern Hemisphere. The Second Sun dissolves into a wisp as the optimal angle for sunlight bounce comes to an end. And Alberto’s latest shows the heavily shrouded Nibiru at the expected 4 o’clock position when captured at Noon in Italy on July 13, 2017. The filter screening for light in the red spectrum shows how the plethora of Moon Swirls curl under the Sun, in the view from Earth, and then above the Sun along the left hand side. The String of Pearls is shown too. This is all coming closer! 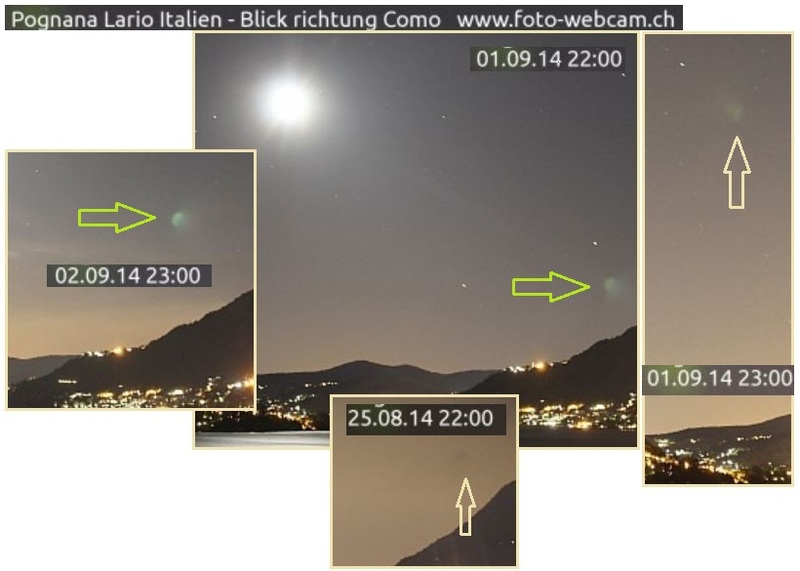 But it is not just the public in the USA and Brazil and Italy who are seeing Nibiru these days. 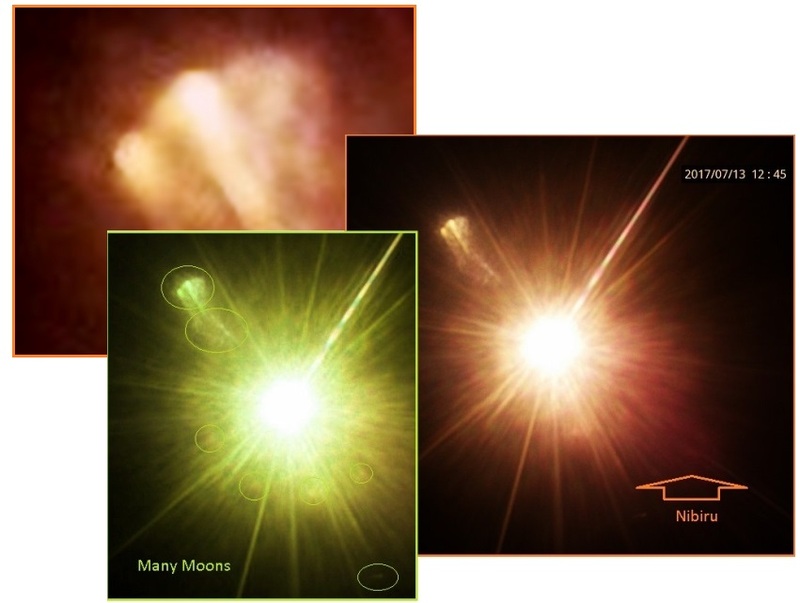 Where NASA cuts out evidence of the Nibiru complex from the SOHO and SECCHI images, on occasion an image slips through. This happened in 2009 when the Winged Globe appeared briefly on a SOHO image. And now evidence from a Stereo Ahead satellite in 2008. At this time, the Stereo Ahead satellite was to the right of Earth in their share orbit, so the Sun is on the right, the Earth on the left, and Nibiru near the orbit of Venus between the Earth and Sun in the view. Jupiter is presumed in the vicinity, but would be much smaller than the Nibiru body. The Nibiru capture, an object the scientists are calling “Baffle”, is much larger than Earth, as Nibiru is 4-5 times the diameter of Earth. 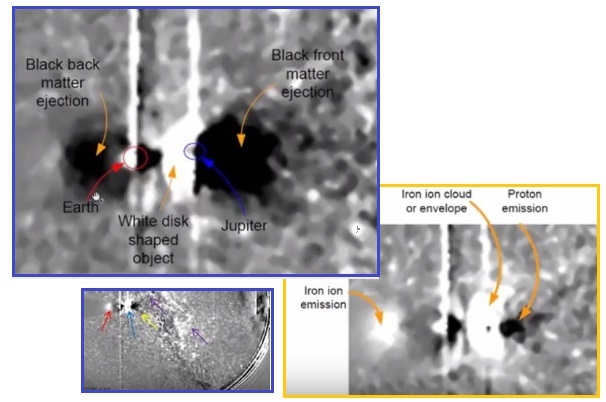 Various puzzling emissions caused by the Nibiru presence are also noted. The Earth’s Dark Twin, which normally shares an orbit with the Earth, positioned exactly opposite the Earth so it cannot be seen, has been making appearances since Nibiru arrived in the inner Solar System in 2003 and blocked the Earth in her orbit. The Dark Twin was not blocked, so approached from the rear, and has been looming closer and attempting to slide past the Earth. This was last detailed in Issue 487 of this Newsletter in January, 2016. 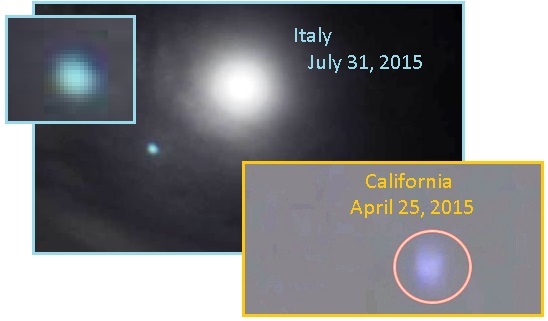 Periodically there are solid captures of the Dark Twin on film, as in these from 2015 in California, 2014 in Italy, and 2011 to 2004 from China and locations in the USA. ZetaTalk Description 10/15/1995: Your Earth has a dead twin that shares her orbit and is placed so exactly opposite the Earth that it can never be seen. Theories about the Earth's dark twin, which does exist, have been around for decades. They emerged because of the observed perturbations of the planets. This twin is close enough, within your Solar System, to be visible by the reflected rays from the Sun, if it were not hidden behind the Sun. Why do these matched planets place themselves exactly opposite? Put two ball bearings in a circular track and spin this, and you soon find that the balls are opposite each other. Just so do these two evenly matched planets find this position opposite each other. Now visibility of the Dark Twin has taken a giant leap forward. Seen through the red dust that seems to be permeating the upper atmosphere, it has loomed so close that features on its surface can be seen! 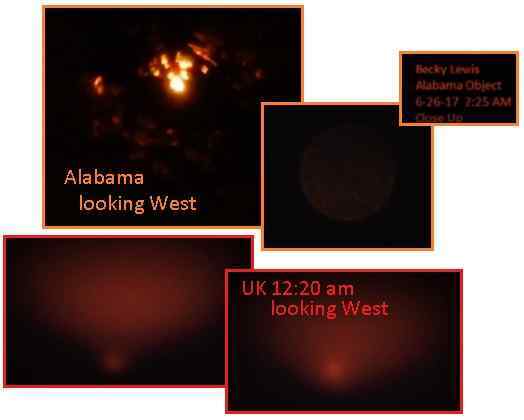 Both within days of each other, photos from the UK on June 17, looking West just after midnight at 12:20 am and in Alabama on June 26, looking West again between 2-3:00 am – there it is, looming every closer! The Alabama captures zoom in, and provide detail of the surface, plus the Dark Twin is reflecting sunlight at times, providing even more illumination. The object was very red and behind the chemtrails. I don't believe it to be a rescue flare at sea as l spotted the red colours on the horizon. It was shocking to see the size of it and the way it moved down onto the horizon. Becky Lewis posted a YouTube video of the Northwestern sky, of a fiery red conflagration, that for all intents and purposes reminds me of the Dragon of revelations. This is the most extreme capture I have ever seen. Literally jaw dropping. ZetaTalk Comment 7/31/2017: We have placed the Dark Twin of Earth as currently coming up behind the Earth in their shared orbit, and now attempting to slide behind the Earth in order to pass. The Dark Twin is not magnetic, and thus does not interact with Nibiru in the same manner as the Earth, which is in a magnetic dance that binds both parties to each other. But due to the gravity Repulsion Force, which keeps planetary sized objects from colliding, and due to Orbit Lock, which forces the Dark Twin to remain in its current orbit, the Dark Twin does not have freedom to move. Thus just after midnight in the Northern Hemisphere, in Alabama and the UK, and looking back along the shared orbit that Earth and the Dark Twin share, one can often find the Dark Twin looming in the night sky. This is looking to the West, with the Dark Twin dropping into the western horizon as the globe turns toward the dawn, toward the East. If the angle is optimal, sunlight, which is always present, will illuminate the Dark Twin with reflected sunlight! This may even show surface features of the Dark Twin, which is a planet sized object equivalent to the Earth. 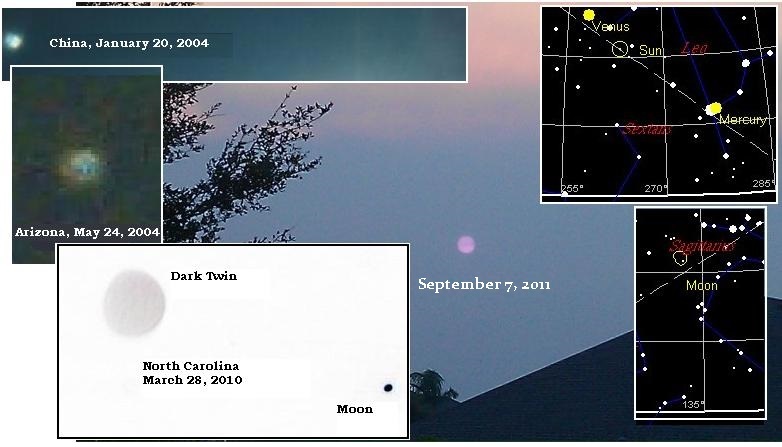 The angle of visibility has changed over the years, from 2004 to 2011 and on, as the Dark Twin moved closer to the Earth in their shared orbit and also attempted to drop behind the Earth in an effort to pass, as this Pole Shift ning blog details. Per the Zetas, the Dark Twin will escape this squeeze during the Last Weeks, but until then, will be a presence in our western skies. As we have repeated asserted, Global Warming is a hoax to be used as a cover for the Earth changes anticipated during the approach of Nibiru. Global Warming was been contested from the start. Two UK scientists - Dr. Seymour Laxon and Dr. Katharine Giles – were assassinated in 2013 so they could not divulge what they knew of the scheme. The UN’s lead scientist, the UK’s Phil Jones, had deliberately submitted fraudulent data. The real data shows no Global Warming. But if the past is made to be increasingly colder than it was, then a warming trend can be presented. It is all a lie! 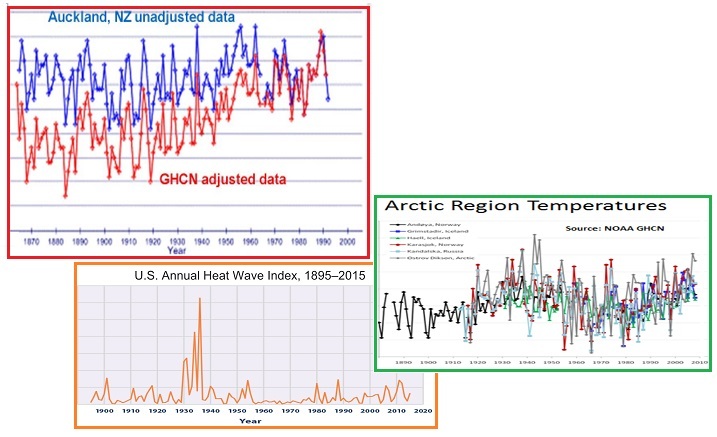 The magnitude of their historical data adjustments, that removed their cyclical temperature patterns, are totally inconsistent with published and credible U.S. and other temperature data. Thus, it is impossible to conclude from the three published GAST data sets that recent years have been the warmest ever –despite current claims of record setting warming. These “adjustments” always prove to be to the upside. Always warmer, never cooler. It was nearly always accomplished by systematically removing the previously existing cyclical temperature pattern. The problem, of course, is that there is no global warming according to the above referenced report. ZetaTalk Comment 11/28/2009: Global Warming, as we have long stated, is not the cause of the current Earth changes, but is rather a cover chosen to explain many of the anticipated Earth changes. It is no secret that under Bush, scientists were told what to say, ordered to toe the line. The media is controlled. Al Gore went forward like a sacrificial goat to tout the line, knowing that eventually he would be shamed for this. Those who have been silenced during the cover-up over the approach of Nibiru, the pending passage, are often in agony, wanting to inform the public but aware they might be silenced, killed, if they do not remain silent. Recently a famous scientist, involved from the beginning with the Global Warming fraud, simply could not hold back. Read his comments and see if they apply to the man-made Global Warming scenario, or to the Nibiru passage scenario. If the latter, in his view, mankind has but 3 years until the passage. Reto Knutti – Famous Swiss climatologist and professor of physics of Earth’s climate at the Institute of Atmospheric and Climatic Science, Zurich. 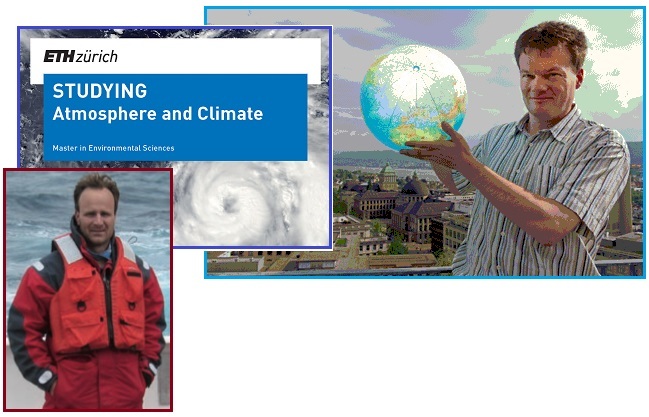 A scientist of world renown is known for his research related to climate models. He was one of the key members of the Intergovernmental Panel on Climate Change. At the end of 2016 he took an active part in the work of the International Group of Leading Climatologists of the World, which, together with the leading weather forecasters of the World, issued a closed report on the impending weather and climate catastrophe that will begin in 2017. You understand that those who are at the top, their plans and views on everything and everyone, and that they measure by their measure the truth that can be given to people. They think that they are above nature, above processes that are already in full swing. They think that the elect can survive these processes, sit out hiding in comfort, and the rest of humanity they do not care. They are afraid either of panic or of the fact that people will begin to demand that their governments start taking measures to prepare themselves for the meeting of the horror and chaos that have already begun to approach. Do you have three more years of quiet life, you live in Switzerland? If you lived in America, China, India, Europe or Russia, then for you and these would not have been three years. And so. Devote these years to your family and try to prepare. Do not make plans to buy a new fashionable car or promotion. Think about something else. How to preserve your life and the lives of your family in new conditions that have already come into our lives with new abnormal and extraordinary weather conditions. Try to just survive in the coming years. ZetaTalk Insight 3/3/2004: Knowledge other than rumor about Planet X and the coming cataclysms was very limited prior to 2003 when the earth changes and visibility of this monster looming into view changed the modus operandi. Many meetings between the Bush Administration and heads of state had as their basis bribery and threats to go along with the cover-up, which was explained as necessary so that panic would not ensue. Planet X was explained as something that would pass through the solar system and go on its way, causing no more than the earth changes experienced to date. It should be born in mind that most countries do not have the ability to peer into space, the Space Station and Hubble and probes restricted to the US and Russia. Observatories are expensive and as funded enterprises the wealthy can exact the equivalent of national security oaths from astronomers working there. These restrictions and a few obvious assassinations keep this information close, not in the public domain.